My admiration for the amazing achievements of the late Shaikh Rashid Bin Saeed Al Maktoum is an open secret. His energy and enthusiasm to put his birthplace on the map were as boundless as his love for his people. His foresight, wise decision-making and willingness to listen to the opinions of others, whether they were representatives of influential families or simple fishermen, are well-documented. I was one of the lucky few who knew him as a mentor and friend. I visited him at his majlis almost daily to discuss the events of the day, even towards the end of his life when he could no longer get out and about but was hungry for news and assurance that all in the country was well. When Shaikh Rashid finally succumbed to a long illness on October 7, 1990, I felt that the bottom had dropped out of my world. I mourned him as I did my own beloved father. I missed his presence. My heart was heavy as I wondered what would become of Dubai now that he was gone. Surely, there was no one fit to walk into the shoes of such a unique leader. Shaikh Rashid’s genes are alive and well in his sons — each endowed with different strengths, but all faithful to the path their father had chosen, a path ensuring security, peace and prosperity for every citizen of the UAE, a place where entrepreneurship would flourish so that no one would be homeless or hungry or without amenities and opportunities that most of us take for granted today. At a time when so many people within our region are troubled and insecure facing an uncertain tomorrow, I would like to remind my compatriots how fortunate we are to have at the helm President His Highness Shaikh Khalifa Bin Zayed Al Nahyan, and His Highness Shaikh Mohammad Bin Rashid Al Maktoum, Vice-President and Prime Minister of the UAE and Ruler of Dubai. Individually and together, they represent the kind of stability and continuity that is not only lacking among most of our neighbours, but also in western democracies where each time an election brings about a change in government, grand plans are shelved and policymakers return to the drawing board. Writing as someone who was born and bred in Dubai, I thank God for giving us Shaikh Mohammad. I admired his strength of character during our youth, but had no inkling of the man he would grow up to be. Like his father, he is innovative, hard working, generous, compassionate, a family man whose values and ethics are beyond reproach. He has taken Dubai to heights that Shaikh Rashid could never have imagined in his wildest dreams and, more than that, on a personal level, he is respected around the world for his sportsmanship, emotional Nabati poetry and philanthropy. 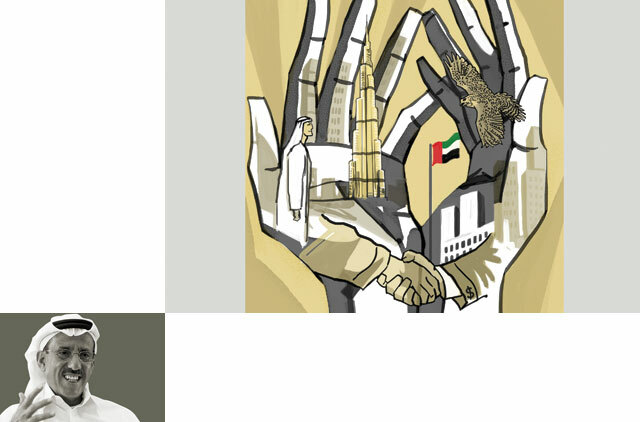 The Mohammad Bin Rashid Al Maktoum Foundation was launched to improve knowledge throughout the Arab World. The goal of his Dubai Cares campaign was to educate one million children from poor families, while Noor Dubai has given the gift of sight to one million visually-impaired in developing countries. Shaikh Mohammad has high standards and he can be tough on those who fail to live up to them, which is why Emiratis consider him to be a pair of safe hands. One of his greatest attributes is his caring nature to which everyone who knows him would attest. He is not only generous with his money but also with his time. Recently, I benefited from his encouragement when he visited my group’s head office in Jumeirah, accompanied by his son, Shaikh Maktoum Bin Mohammad Bin Rashid Al Maktoum, Deputy Ruler of Dubai. I told Shaikh Mohammad how honoured we were to receive him and what a positive boost to our endeavours his visit signified. He showed great interest in my companies’ plans and projects, especially in the hospitality sector, structured to meet the growing needs of foreign visitors and UAE residents. I was delighted to brief him on our construction of three hotels — St Regis, W Hotel and Westin — that, together with a Las Vegas-style theatre, would comprise Dubai’s first-ever integrated resort as well as our development of Dubai’s first Waldorf Astoria luxury resort on the Palm Jumeirah. I could not help but look back to the days when I would join Shaikh Rashid on inspection tours of construction sites at a time when the only five-star hotel in Dubai was the Inter-Continental, gracing the Creek. Shaikh Mohammad shares the same forward-thinking philosophy as his father, never pausing for an instant to rest on his laurels. He takes his responsibility as the guardian of our children’s future with the seriousness it deserves. Is there any other place in the world where a ruler, a prime minister or a president takes time to visit someone’s office to show his support in the way Shaikh Mohammed has done? How many world leaders are gifted with the personal touch to the extent they will study private sector projects, offer their opinions and instruct their teams to facilitate work that will enhance the city’s stature? Do heads of state in the US, UK or Europe pay visits to private companies to discuss their work and give advise on their plans? Not in the First World, not in the Arab World ... Nowhere else, except in the UAE. Shaikh Mohammad is a role model for world leaders who fail to interact with ordinary people and the business community. The people of the UAE are one family, one blood, one group. We differ from other nations in our way of thinking. We all come from the same origins, the same background. We understand one another. If we only knew how privileged we really are! It is my hope that the close relationship between the ruler and the people remains for generations to come. This political system works for us and almost for every man and woman in this nation want it to endure. We want to continue living in harmony as brothers and sisters. We want to continue enjoying the freedom to offer our opinions to our leaders, with the knowledge that those opinions are being heard. And rest assured that we will fiercely defend the status quo from the ungrateful few who are out to derail it. Khalaf Al Habtoor is a businessman and chairman of Al Habtoor Group.